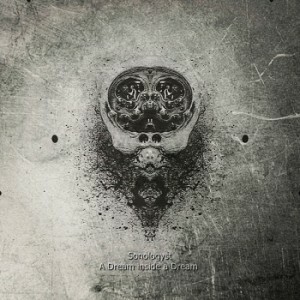 Raffaele Pezzella is the man behind the experimental dark ambient act, Sonologyst. He is also the head of Unexplained Sounds Group as well as its sub-label Eighth Tower Records. I had a chance to speak with Raffaele about some of his musical background, his inspirations and the vision he has for the future of his labels. Thanks for reading, I hope you will enjoy our conversation. Michael: Thanks for your time Raffaele. You seem to be a very busy man, with a lot of things happening at any time. Let’s start from the beginning. Is Sonologyst your first musical project, or have you played as other names, or in bands before the founding of Sonologyst? Raffaele: You’re welcome Michael. Before Sonologyst I just made a mini album in 2000, under the name Memorie Elettroniche Sonore. It was published as CD by TDK. This famous industry launched a sort of music competition and my work was selected for a production; then it went into obscurity. But they sent to me a $100 check, and that time it was nice to me for starting. 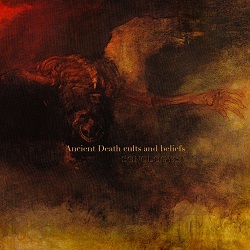 Michael: Sonologyst takes a rather experimental path, as far as dark ambient music is concerned. Do you consider Sonologyst a dark ambient project, or do you have some other tag that best describes your music? including various forms of avant garde, jazz, rock, music for cinema and so on, I couldn’t do music, but in a dark mood. It’s part of my subconscious. I don’t know what’s the origin of this attitude, but I’m sure it has to be searched for there. Michael: Have you always been interested in experimental music? Was there a time in your past when you only listened to more traditional forms of music? Raffaele: I started to listen to experimental music in early 90’s. As many young people, in the early years I was used to listening to rock and pop music. Then I discovered alternative kinds of music, after reading William Burroughs books, and being acknowledged of his experiments with tape recordings of dead people voices…or stuff like that. I was terribly fascinated by those strange recordings, and everything started from that. Michael: You live in Italy, some would say the center of the world, along with Greece. Does your country have any influence on your music? Raffaele: No I don’t think so. Rather than from my country, it’s possible I had influences from the suburbs of my city, Naples. There I always was used to living in a constant ambience of noisy and chaotic stimulations.The ideal place to start to thinking in asymmetrical ways. Michael: Are there specific tools you use for Sonologyst, or do you constantly change instrumentation, synthesizers, field recordings? Raffaele: For a long while, maybe 3 years, with the Sonologyst project, I went deep into electric guitar experimentation, playing the instrument on a sort of surgery table, and trying to get a sound that was not recognizable as a guitar sound. events. Now I’m mainly experimenting with synthesizers and field recording samples, but the ideal to me would be to make music just by the act of thinking. Sometimes I feel the instruments like a slavery. Michael: A Dream Inside A Dream was rather well received. Do you have a new album in the works? Raffaele: Currently I’m working on a better production of some past works of mine. A vinyl production for the album Silencers.The Conspiracy Theory Dossiers, in collaboration with a new label from US, is going to be released within Autumn 2017, and possibly a CD release of my work Electrons. A Scientific Essay could be produced. Meanwhile there are some tracks under construction, but I still don’t know exactly which direction I’ll follow for this music. I’m waiting for some calling from my subconscious. Michael: When did you decide to start Unexplained Sounds Group? Raffaele: It was at the beginning of 2015. Michael: What are some of the challenges in running such an international label? Raffaele: I started this project just because many followers of my Facebook group asked me to create something like a label. Actually my original idea was to build a sort of network, rather then a traditional label, cause I believe in a constant relation between people, and I wouldn’t like to be behind the curtains, just producing and selling records. It would be boring to me. So the first challenge is to preserve this original spirit, I mean the “human side”, without being absorbed by the business. This is the reason why I run a streaming radio transmission every Sunday night. There’s a lot of human feeling there, opinions and sensations exchange. If I lost that, it would be the end of my project. Michael: A large portion of Unexplained Sounds Group is dedicated to focusing on music from specific countries. Will this series of releases continue expanding outward over the coming years? Raffaele: Yes I love that kind of re-search. It’s like an ocean of music, where you have to find some specific species and understand the differences between them. Even if the globalization fixed some standards to the music all over the world, it still remains a difference between the music of a country comparing with another one. And this is not just a music experience, but a wider cultural experience.That’s the reason why I chose the compilations as my main field of work. Michael: The latest release on Unexplained Sounds Group is Visions of Darkness in Iranian Contemporary Music. There seems to be an increasing amount of great music coming out of Iran these days. What is the situation like working with artists inside a country that is so separated from the international world? 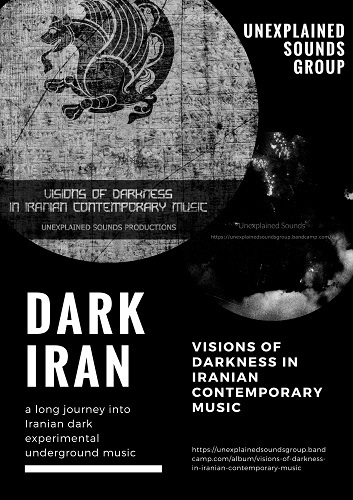 Rafaelle: Visions of Darkness in Iranian Contemporary Music is the 2nd compilation released by USG, focused on Iranian music. The 1st one being released in 2016. The experimental music scene in Iran is quite growing and getting better year by year. From my point of view, in such cases that scene is even more stimulating than many Western countries ones. Thanks to social networks now we have the possibility to easily reach people everywhere, but certain difficulties remain. Today Iran is in a black list of countries, so there are many more restrictions on the political, security and commercial side. That causes troubles for Paypal transactions, sending and receiving many to and from the country and so on. But despite those difficulties there’s a lot of enthusiasm and collaboration to highlight the music from Iran via releases and radio programs. That is a mission for Unexplained Sounds Group, and in case of Iran it’s an even more exciting mission to promote those artists and projects coming from deep Persia. I have to thank very much all my friends from Iran for their effort and trusting USG network, with a special mention to Mohamed Reza (aka Xerxes The Dark, Nyctalllz) for collaborating on the project’s selection. Michael: Do you think these large compilations or full lengths by individual artists, such as the latest by Ashtoreth, are more important to Unexplained Sounds Group? Raffaele: I like to work on both of them, and releasing the Asthoreth album was a really beautiful work, I’m very proud of. And I can’t exclude to release other albums that way, even including another release by Ashtoreth. But as I said before, to work on music scenes from different countries, or around a certain theme, like I did with the compilation about the music derived from analog devices, is probably my main interest. Michael: You have also more recently started the label Eighth Tower Records. Would you like to explain a little about that label and how it differs from Unexplained Sounds Group? Raffaele: That’s a good question indeed. I introduced Eighth Tower Records to the people, as a label focused on obscure ambient music, the so called “uLtraterrestrial fRequency” music. That was just to give a short idea of what I was going to realize. But actually I’m trying to build a bridge between dark ambient music, a genre of music I love a lot, and my passion for ancient philosophies, heresies, mythologies and alternative kind of human thought. Every release works around a specific theme with references to the argument I’m interested through my readings (Superspectrum theory, Gnosis, Metempsychosis were the first three). In some way it’s like I was trying to create an hybrid between a music label and an alternative journal focused on obscure kind of thought. Michael: So far all the releases on Eighth Tower Records have been compilations, will there also be full-length albums by individual artists? Raffaele: Yes, it’s my intention to release albums by individual artists as times will be mature.It’s possible I’ll start with a split album. Michael: Will you plan to do physical releases on Eighth Tower Records? Michael: What are some of your personal hobbies, when you are not working on music (if there is ever time for that!)? phenomenons and so on. It’s from those documentaries that I found inspiration for my album Unexplained Sounds from which I got the name for the network. Raffaele: Difficult to say just a few one. But Videodrome, La jetée, Prince of Darkness, Le Locataire, Lost Highway, were between my obsessions for a long while. Michael: The world seems to be in a constant turmoil. Do you think the apocalypse is coming, and if so how do you think it will happen? Raffaele: I really don’t know if an apocalypse is coming to happen, at least in the common sense we attribute to the word. Its’ quite sure that it’s an idea very deeply established in people mind. In some way, in the internal mental space of the people, including me, apocalypse is already happening. It’s a state of mind the English writer James Ballard, investigated very well in his tales and novels. And I highly recommend his works to all people who want to know more about the origin of all near future mythologies. Michael: Thank you very much for your time, I will leave the last words to you! Unexplained Sounds has a lot of support and the listeners are very appreciative to Raffaele for his ongoing dedication and commitment to gathering experimental music from across the globe and disseminating it for our eager ears. “Music is out there” but because of Raff’s work we know more about it and how and where to download and/or buy it. Raff is mapping sonic pathways for listeners to be curious and to learn more about the really interesting artists that cultivate experimental music globally. Well spoken. I couldn’t agree more!